Aladdin Industries makes the Hopalong Cassidy lunchbox in 1950-the first character box ever produced-and a new industry is born. Young WWII veterans now have families, and the baby business is booming. 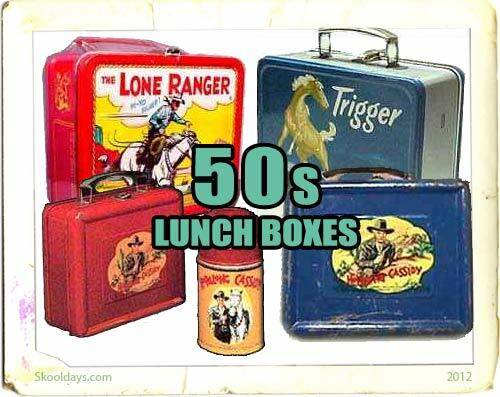 Fueled by the invention of television and the popularity of the Western, children across America toss the brown paper bag in the garbage and start carrying lunch to school in metal boxes decorated with anything from Disneyland to Roy Rogers. This entry was posted in LunchBox and tagged 1950 by Skooldays. Bookmark the permalink.